The Lightweight Structures Laboratory of IPT, located in the city of São José dos Campos, was contracted by Centro Brasileiro de Pesquisas Físicas (CBPF) to develop and manufacture structural sandwich panels made of carbon-fiber composite materials. Such panels are being considered to be used in the largest particle accelerator of the world, the Large Hadron Collider (LHC) of CERN. The manufacturing was accomplished by first laminating the skins, and then bonding them to the honeycomb core, using epoxy. The bonding process considered parameters to avoid torsion and bending of the components. “For example, the value of pressure applied to the skin and core during the bonding, as well as the period of pressure application, even after the resin cure was mostly complete”, explains Nascimento Jr.
Two panel configurations were produced. 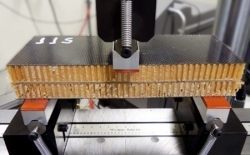 In the first one, says the researcher, it was just one skin in carbon fiber composite bonded to a honeycomb core, i.e., skin + core; in the second, two panels of the previous configuration were joined with a polystyrene (PS) core between them, i.e., skin + core + PS + core + skin. The mechanical performance of both kinds of panels was studied under bending forces, in order to verify stiffness proprieties and failure modes. The main objective of the project was to identify manufacturing parameters that were critical to achieve given planicity and mechanical behavior.